Aibolot Makenov in the School of Design and Human Engineering (DHE) at UNIST has been named a winner of the 2018 Red Dot Award for design concept. A recent design project, carried out by Professor KwanMyung Kim and Aibolot Makenov in the School of Design and Human Engineering (DHE) at UNIST has been named a winner of the 2018 prestigious “Red Dot Award” for design concept. The award-winning design, Toguz Korgool board game, is the redesign of a traditional Kyrgyz mancala game played in Central Asian and African countries for decades. 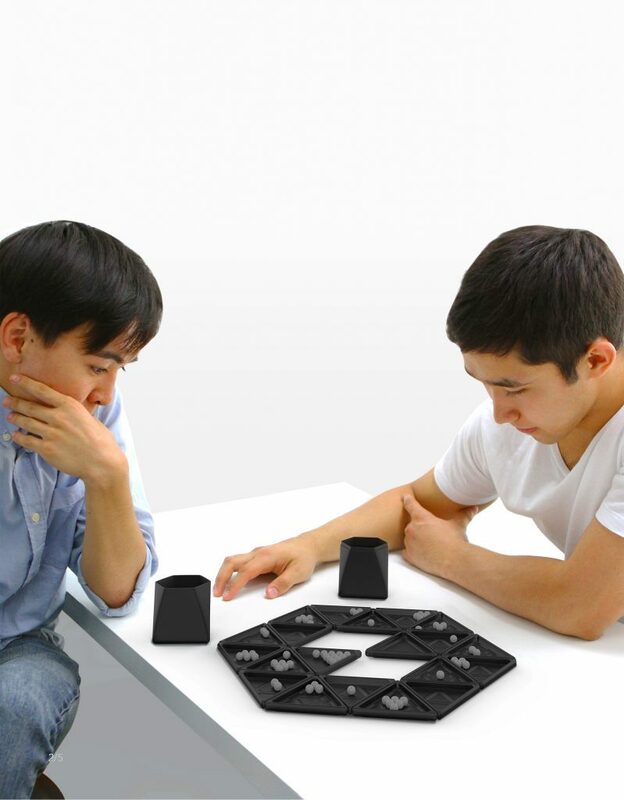 Similar to chess, this is a two-player turn-based strategy board game played with small stones or balls. The aim is to improve users’ general arithmetic skills and strategic thinking skills through gameplay. This new design is meant to look appealing both when it is being played and not in use. When not being played, it looks like a beautiful 20 sided object. The 20 faces are connected with hinges and magnets so that the whole body can be folded and unfolded easily—the entire process also provides an engaging experience. 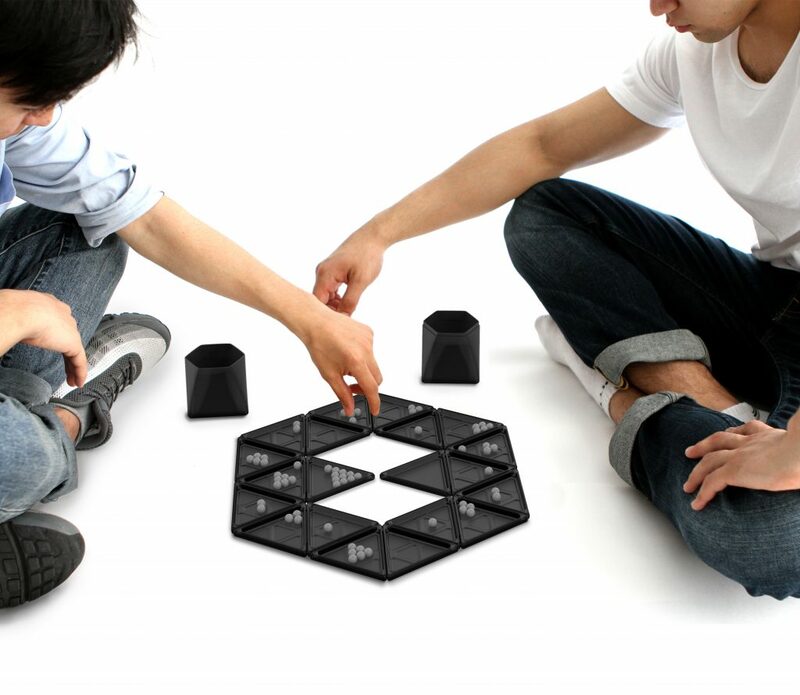 Above is the award-winning design “Toguz Korgool”, the redesign of a traditional Kyrgyz mancala game played in Central Asian and African countries. The game starts with 9 balls on each ball tray. Each player takes a turn picking all the balls from a tray with one ball left. He proceeds to distribute the balls one by one on each tray counter-clockwise. When the number of balls in the last tray is odd, he owns the balls and puts them in a temporary reservoir. This repeats until one of the players collects 81 balls in total. 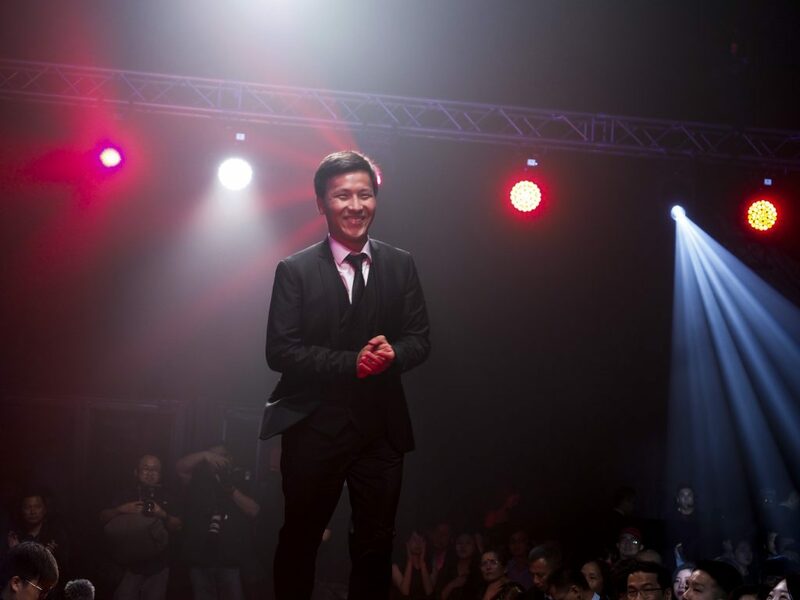 Aibolot, who joined UNIST in 2015, recently received much attention from Kyrgyzstan media when he won the prestigious Red Dot Award (Related Article). He is currently doing an internship at a German-based design firm and plans to commercialize the product in the near future. 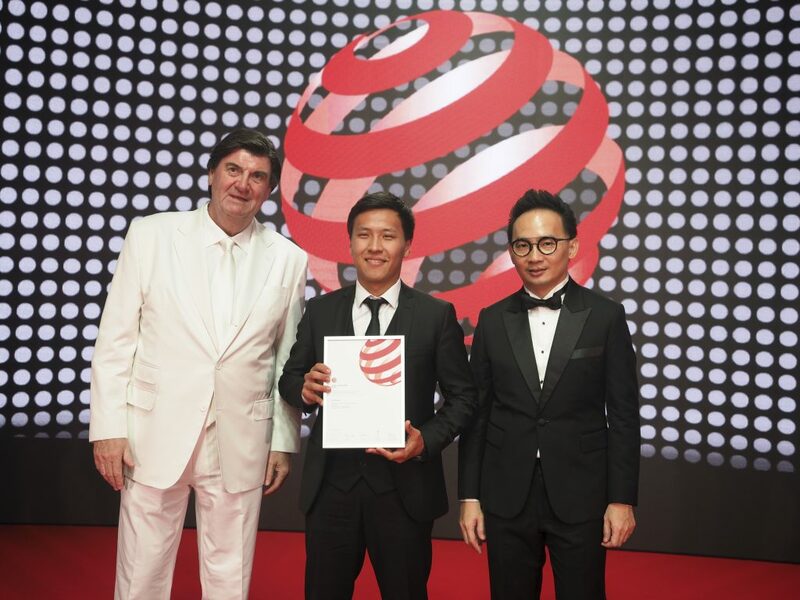 Since its inception in 1955, the Red Dot Design award has become synonymous with prominent industry trends and the highest-quality design. It is also one of the world’s three major design awards along with Germany’s iF Design Award and United State’s IDEA Award. My name is Aibolot, I am 21 years old. I was born and raised in a small village called Kazarman in Kyrgyzstan. When I was 13 with the decision of my family I moved to a bigger city so that I could pursue a better education. For the next five years I studied in the city of Naryn, apart from my family. High school years were indeed not easy. Despite the difficulties at school, though, we have learnt to be independent, adapt to a new environment and constantly watch for new opportunities. After high school, I was accepted to UNIST, where I currently study industrial design. 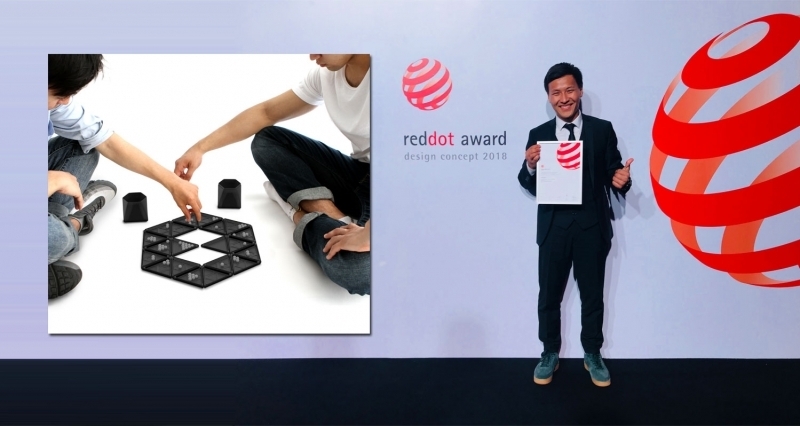 Congratulations Aibolot on winning the 2018 Red Dot Award: Design Concept. Any thouhgts on this? It would be unfair if I had not mentioned Professor Kwanmyung Kim’s support, as it was the key to receiving this award. He was the one who had trusted me and guided throughout the entire project timeline. The knowledge he has provided me with was undoubtedly priceless. Unfortunately, because of his tight schedule, he could not make it to Singapore and so I received the award by myself. It was a great experience to be honored on the famous Red Dot carpet, right in front of a crowd of professional designers. Additionally, I had the opportunity to network with designers, which I am hoping will lead to collaborations in the future. 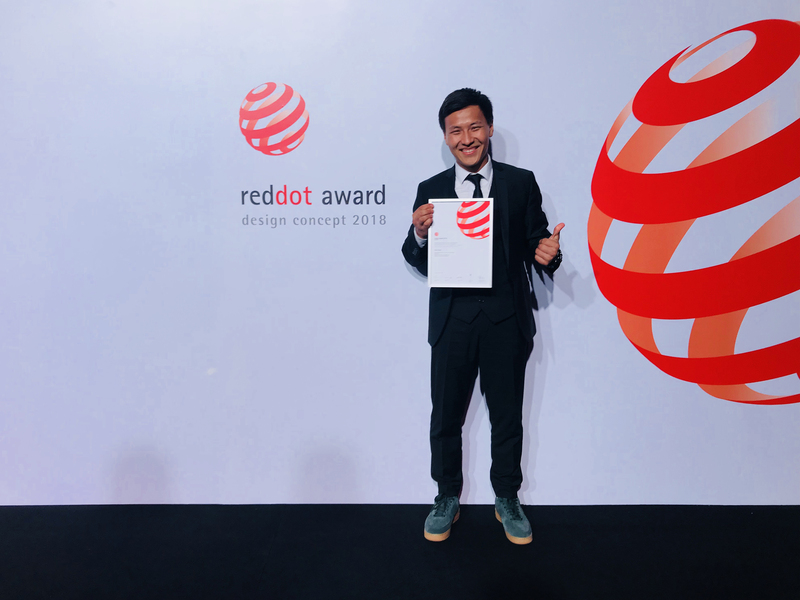 Aibolot Makenov (School of Design and Human Engineering, UNIST) at the 2018 Red Dot Design Award ceremony, took place in Singapore on September 28, 2018. Please tell us more about the board game, “Toguz Korgool”. And what was the most important consideration in this design project? Toguz Korgool is a traditional game which has been played for many decades in my country. Other than its benefits in improving strategic thinking, it also promotes mathematical thinking especially with the use of arithmetic skills, as players should constantly count and carefully watch the balls in order to win the game. After conducting a thorough research, one of the problems that we have identified with the game was that it did not really attract people with its design. With many other board games, it was usually kept somewhere in the closet where one would almost forget its existence unless they come across with it. Therefore, we wanted to give it a new look with a compact, visually appealing and user-friendly design. As a result, we came up with this concept. 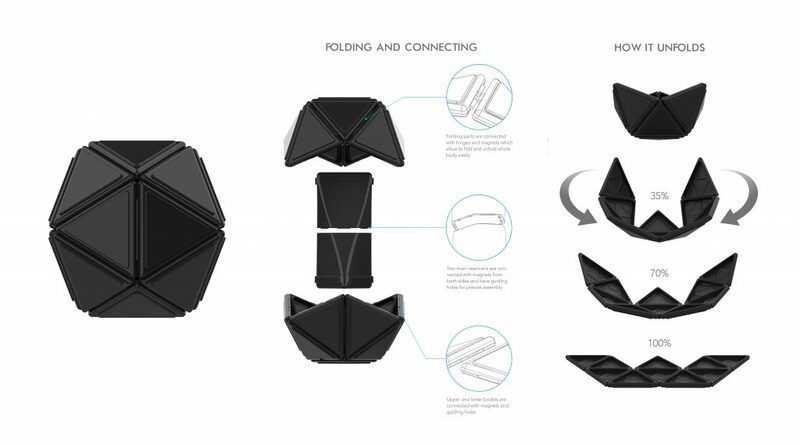 In the design process, it was challenging to find the right shape since we wanted to make something that is foldable, which at the same time would have 18 facets as the traditional design does. Now, we believe that we achieved a design which is highly user-friendly and at the same time aesthetically appealing which can be also used as a decorative element at home. Shown above is Toguz Korgool board game, which has been proposed by Aibolot Makenov. How did you embark on this redesign project of “Toguz Korgool”? And how did you come up with the idea of merging a traditional game and modern design? It has a very personal story behind. When I discovered that I had my passion in design, the next question in my mind was “How can I contribute to my home country with my skills”. I think this thought gave me a firm push towards coming up with the idea of redesigning our traditional game. This project has started last year as a final assignment for my CAD (computer-aided design) class. After presenting my idea in the class, Professor Kwanmyung Kim gave me the idea of bringing this product to the market. As a first step, we wanted to validate our product, and so we applied to Red Dot, which ended up successfully. Giving a modern look to this board game was in fact not that difficult, as this was something we have had to keep in mind for all the designs we have been doing. Toguz Korgool, proposed by Aibolot Makenov, is a two-player turn-based strategy board game played with small stones or balls. Please tell us more about your life at a German design company. I think working in Germany taught me how to build the life and work balance. Here, I came to realize that we should spare time for our lives, as much as we spare time for our job. It could anything as simple as going out with friends, or doing sports, reading books, etc. This, for some reason, was something I have not realized throughout the time I have spent in Korea. Working in a company in general, on the other hand, strengthened my soft skills such us communication, leadership, time management, and so on. I am especially happy that I could improve my communication skills both in the process of design and in networking with other designers. As a designer, it is crucial to be a good communicator. After all, only by good communication are we able to come up with novel ideas and create great products. I am interning here as a product designer, whereby I support the company with ideas in various projects. They allow me to dig into all design processes starting from ideation till the production stage. Most importantly, I get to learn how to think from end user’s perspective and try to fulfill their wants and needs, which are among the key aspects of a good design. I think design thinking we learn here can be used in many other fields other than industrial design itself. It is a powerful tool which can be used to solve problems with the help of creativity, by looking at them from different perspectives. How did you get an opportunity for an internship in Germany? Working in an environment with people of unique cultural backgrounds has always been interesting to me. In the beginning of this year I decided to go abroad and challenge myself to experience work – life balance in a completely new setting. I had this goal to put my design skills into test with real world projects and I was ready to work even for free. Hoping that I could land an internship in Europe, I have applied to nearly 50 companies, asking them to take a short look at my portfolio. I was rejected by more companies than the ones I received a positive response. For me, it was very important to convince HR managers to have a talk with me on Skype; for afterwards, I was quite confident that my communication skills would have me pull off the interviews. But then it took some time to learn how to nail the interviews. After having a couple of them, I already knew what my strengths and weaknesses were. In the further interviews, I tried to focus more on my strengths and talk less about my weaknesses. In the end, I had some successful interviews which led me to land a paid internship in Germany. Aibolot Makenov (School of Design and Human Engineering, UNIST) has been named a winner of the 2018 prestigious “Red Dot Award” for design concept. What brought you to UNIST? It was a very sudden decision to study in South Korea. Until my senior year at high school, I had always planned stay in my country. But one moment had completely changed my opinion. It was the moment when I heard a friend of mine discussing about UNIST with Korean students who had come from Korea for international Olympiads. After hearing that, I was very interested to study at UNIST, and that is how I ended up here. Why did you choose industrial design track? And what is the attraction of the track? I wanted to be an architect after I graduated from high school. I always loved the fact that they come up with amazing design ideas, and so I wanted to become one of them. But then after arriving in Korea, I was amazed by how many Korean students preferred to study chemical engineering here. It influenced me so much such that out of pure career concerns, I ended up selecting chemical engineering as my major, although I have had no interest in it. After a semester though, I felt lost and started to think about what I really wanted. As a result, I decided to become an industrial designer instead, and I am now very proud by the decision I have made at that time. There are many things I would like to accomplish. But for now, my focus is on Toguz Korgool. We are planning to make it available worldwide. For that, we are now improving the design and working on potential sales and marketing strategies.